The Rock can do anything, because he is superhuman. That is just a fact. But can he defy all scientific logic and explanation? Can he take to the sky and fly? That’s exactly what he’s going to find out in his next movie Skyscraper, and it’s already shaping up to be the can’t-miss action flick of the summer. Dwayne “The Rock” Johnson seems like he has already done all that life as a human being has to offer, so it makes perfect sense that he would try to level up as a bird for his next move. But the China-set disaster movie Skyscraper may be pushing his already exceeding limits for the first time ever. Universal Pictures dropped the first teaser for the high-flying action film during the Super Bowl last night, and if the short clip didn’t already set your heart racing at a dangerous pace, then you are definitely not ready for the full-length trailer that was released during The Tonight Show Starring Jimmy Fallon after the big game ended. Because not only is The Rock trying to fly…he’s doing it with only one leg. That’s right, Will Ford (aka The Rock’s newest onscreen alter ego) is a former FBI agent who lost a leg during a mission gone wrong, and now he’s trying to make sense of a quieter suit-and-tie life and make ends meet for his beautiful, loving family. He’s got two cute tykes at home and one smokin’ hot and super supportive wife (played by Neve Campbell, no less!) so you know something horrible is about to happen. The calming music at the beginning of the trailer shouldn’t fool you. 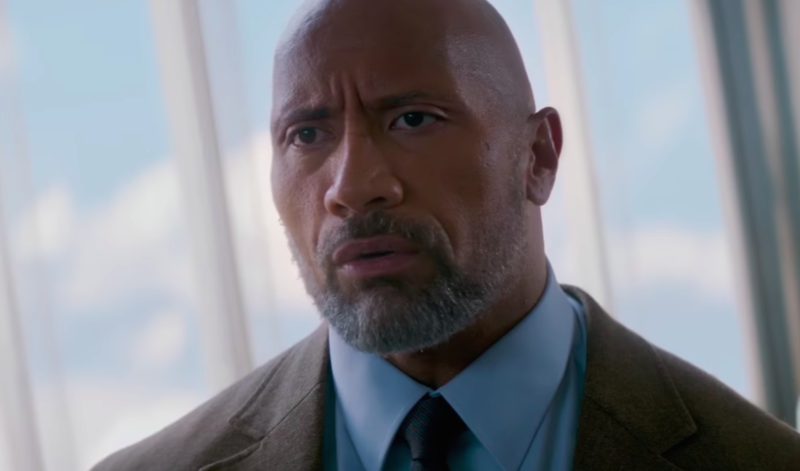 And yep, no surprise here when all hell breaks loose about a minute into the footage, and it should also come as no surprise that The Rock warned everyone this would happen. Why does no one ever listen to The Rock’s warnings?! Also, never mess with this man’s family. He will literally take a running leap off of a construction crane 240 floors in the air and attempt to jump into a burning building. Twenty bucks says he makes it (even though the math doesn’t really check out – maybe parabolas are the one thing The Rock doesn’t excel at!). Prepare yourselves now: Skyscraper hits theaters July 13th, 2018.